This article is about the artifacts. For the novel, see Halo: Cryptum. A Cryptum was a stasis chamber used as a means of exile by the Forerunners. Cryptums were most prominently known for their use by the Prometheans, the Forerunners' highest class of Warrior-Servants, who also termed them as Warrior Keeps. A Cryptum is a sealed capsule where a high-ranking Forerunner would enter self-imposed exile, often as punishment for failure or dishonor; it was known to be used by those in power as a means with which to silence respected individuals whose punishment otherwise might prove problematic in the eyes of the public. However, some Forerunners occasionally entered a Cryptum voluntarily, in pursuit of a higher state of awareness. When in use, a Cryptum's occupant would enter a timeless state of meditative hibernation known as xankara. In this state, the Forerunner's mind would be wholly immersed in the Domain and they would be able to explore the immense stores of information contained therein. The Forerunner would become unaware of the physical world around them, and could remain in a state of suspended animation for thousands of years. Cryptums required an extraordinary amount of force to breach once sealed. They denied access to every species except Forerunners; however, after being designated as Reclaimers, humans have been shown to be capable of unsealing Cryptums. The nature of a Cryptum was unknown to most Forerunners, including Bornstellar Makes Eternal Lasting. However, he was aware that the violation of a Cryptum invoked dire consequences, one of which was angering the powerful Prometheans. Although Cryptums were often associated with the Prometheans, Forerunners of most rates could choose to enter one. The Forerunner scholar known as Boundless, a member of the long-defunct rate of Theoreticals, was forced to enter a Cryptum after continuing her studies on Forerunner origins and Path Kethona in defiance of Warrior orders. 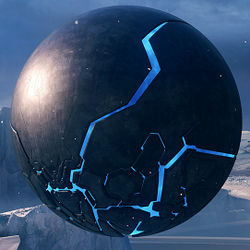 After being opened a thousand years later, it was discovered that the Cryptum had been faulty, likely due to sabotage, and Boundless had died inside. Due to their sacred nature—specifically the involvement of the Domain—a Forerunner's entry into a Cryptum was traditionally a highly ritualistic process, overseen and guided by an associate of Haruspis. The associate would remove the would-be exile's armor and administer them gradual doses of a chemical known as inchukoa, which caused the body to shed most of its fluids via heavy sweating, initially dried and cleaned by the Forerunner's aides and attendant monitors. The Forerunner, rapidly desiccating and losing consciousness, would then be carried to a chamber housing the Cryptum. Only biological beings were allowed to be present in this stage; no artificial intelligences were permitted. The Haruspis' associate would chant words in middle Digon to aid the Forerunner's passage into the alternate state of consciousness. With the Forerunner almost completely mummified and unconscious, they were delivered into the Cryptum. Three known Cryptums have been described in detail; these differ from one another in a number of respects. A Cryptum was discovered in Djamonkin Crater on Erde-Tyrene by the young Forerunner Bornstellar Makes Eternal Lasting, containing the meditating Didact. The Cryptum vessel, colored copper and steel, was ovoid-shaped, over ten meters high and at least as wide. The millennial seal of the Cryptum was said to be reinforced by two forces; the "wisdom of Harbou" and the "strength of Lang". When the millennial seal was breached, the Cryptum emitted an intense flash of blue light, causing anyone in the vicinity to feel as if time had been suspended; this effect would last for several hours. As the Cryptum opened, it parted outward in three sections above the middle, revealing its meditating occupant inside. While the Cryptum preserved the consciousness of the Forerunner inside for an indefinite period, the occupant's physical body would be maintained in a vitrified state, lacking most of its fluids. The desiccation process was conducted prior to entry in a Cryptum by ingesting inchukoa. Once the Forerunner was removed from the Cryptum, the body would be administered an initial supply of electrolytes, nutrients and other essential substances and then placed in a restorative bath where it would continue its recovery. The body's muscle structure would then be regenerated, a process requiring several days. The Ur-Didact's flagship, Mantle's Approach, was equipped with a personal "combat Cryptum", which possessed many capabilities beyond the conventional one he used during his first exile. The Librarian sealed the Ur-Didact in this Cryptum, which was discovered over 100,000 years later by John-117 and the AI Cortana on the Forerunner Shield World Requiem. 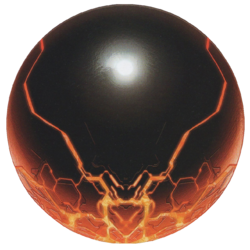 This Cryptum was spherical in shape, with a black outer casing broken by a pattern of angular, orange-glowing "cracks" of hard light bonding. The combat Cryptum had a horizontal diameter of 86.1 meters (282.5 ft) and a height of 85.9 meters (281.7 ft). Notably, this Cryptum locked its occupant in contained slipspace stasis, shielding the Didact from the effects of the Halo Array. Unlike the one discovered by Bornstellar, this Cryptum had not withered the user, as the Ur-Didact remained as physically fit as he had been when he entered; it is unknown if this was the work of the Cryptum itself or the fact that the Ur-Didact wore his personal armor during hibernation. The Librarian had sealed the Didact in this Cryptum in hopes that long exposure to the Domain and meditation on his choices would help amend his motives and heal his mind, which had been severely damaged by his traumatizing encounter with the Gravemind. However, the Domain was later revealed to be of Precursor origin, its neuro-physical construction being obliterated upon activation of the Halo Array. This unfortunate reality resulted in the imprisonment of the Didact's consciousness as well. Trapped in total silence and darkness, the Didact would experience nothing but his own festering rage and madness for eons. Prior to his eventual release, the Didact also appeared to be awake in the Cryptum to some degree, since he was able to perform covert tasks like hinder use of a Cartographer and manipulate radio transmissions. As a combat Cryptum, this Cryptum doubled as a means of transport, being able to travel at massive speeds or even through slipspace if necessary, as demonstrated when the Ur-Didact escaped Requiem's core in his Cryptum via a slipspace rift. It also had the capability to scan its surrounding environment or data networks in order to gather information. However, it had no weapons and was vulnerable to UNSC ones such as MACs and missiles. This Cryptum was destroyed when the Master Chief detonated a HAVOK nuclear warhead inside the Ur-Didact's flagship, Mantle's Approach which it had joined with. Located on the Builder world of Genesis, this Cryptum resembled the Didact's combat Cryptum. In 2558, Cortana used this Cryptum to imprison Blue Team, intending to wake them up in 10,000 years in order to show them the utopia she had created. Similar to the Didact's Cryptum on Requiem, the Cryptum on Genesis did not require the mummification of the occupants necessitated by the Didact's older Cryptum, as Blue Team were placed into, and emerged from, the Cryptum fully conscious and clad in their Mjolnir armor. Before Cortana could escape with the Cryptum, Blue Team was rescued by Fireteam Osiris and Genesis' monitor, 031 Exuberant Witness, who used a swarm of Constructors to wrest the Cryptum from Cortana's control. Several of the Constructors then interfaced with the Cryptum, opening it and freeing Blue Team. The millennial seal on the Didact's Cryptum placed on Earth was sealed by two forces known as the "wisdom of Harbou" and "strength of Lang". The names appear to be a reference to the German actress and author Thea von Harbou and the film producer and screenwriter Fritz Lang, who were married and made several films together. Fictionally, these seemingly out-of-place names may be explained as a quirk of the AI-assisted translation software—which often replaces the original Forerunner proper names with contextually similar Earth names—used to decipher the in-universe documents that comprise The Forerunner Saga. Concept art of the Cryptum on the level Forerunner. Orthographic view of the Ur-Didact's Cryptum. Angled view of the Ur-Didact's Cryptum. John-117 facing a reactivated Cryptum. The Cryptum hovering in place prior to opening. The Cryptum preparing to open up and disgorge the Ur-Didact. John-117 facing the Ur-Didact's Cryptum. Concept art for Halo Wars 2 DLC, depicting a cryptum.